Everyone is aware that a healthy mouth means a healthy body and yet only a few people seem to take the challenge of keeping it healthy seriously. What you eat is what you are and yet a lot remain to eat whatever they feel like eating. Nutrition doesn’t usually come into the picture and become an issue until a person starts experiencing tooth pains. Before you decide what to eat next, it is best that you look into its impact on not just your dental health but your overall health as well. No matter how much you deny it, the effects of what you eat on your nutrition and oral health is undeniably big. In fact, if you choose to eat the wrong things, your immune system can weaken and you can get sick. At the same time, such types of foods usually cause tooth decay and the growth of cavities which could all cause tooth pains and worse tooth problems. If you start eating only the right kids of foods, you will notice how healthy you feel from the inside. 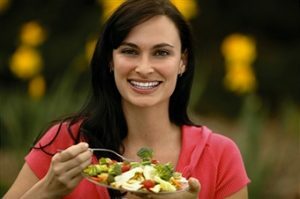 Less carbohydrates, less sugary and starchy foods and high vegetables and fruits will help you become fitter and healthier with a more beautiful smile. To help maintain a healthy smile, and proper oral health, don’t forget to visit your dentist for your regular checkups.